forum.419eater.com :: View topic - Russian scammer babe! She's a new one on me. The population of Russia is about 145,000,000. More than half are female. Did you think you knew them all? always slightly more believable if you dont have models emailing you claiming how desperate they are to find a good man. The pictures may change, but the requests for money are always the same. Here's a clue. You can get a better idea of who you're looking at if you turn up the brightness and contrast a bit. You know for sure that she has a Grundig TV set and an Ekquist freezer. the hottest babe in that picture is Alyssa Milano....and that is on the F'n television I didn't know they get the TV show "Charmed" in Russia.....talk about a crappy show, execept for the babes. My concern is this woman's feet. I think she needs to give them a good scrub. The toes on her right foot appear to be missing, and her left big toenail looks infected. Maybe we could raise money here to get her a good podiatrist. It actually looks like a pic of a girl in a university dorm. Is there anything "distinctively Russian" about this pic? It could be USA, England, etc. I can tell... Russians always look at you like that. 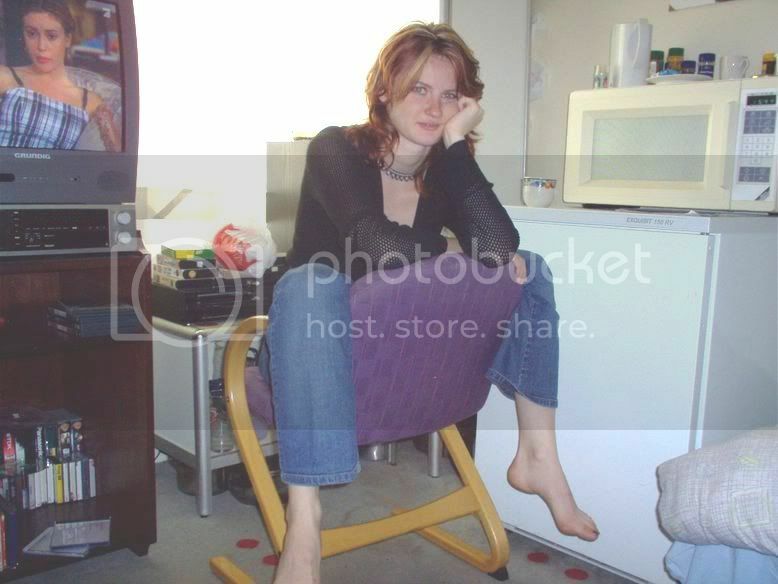 It actually looks like a pic of a girl in a university dorm. Is there anything "distinctively Russian" about this pic? With a Grundig TV and Ekquist freezer, and as louise.slyna pointed out above, watching a German TV feed, my bet would be on Germany or somewhere nearby, like maybe Slovakia. The kitchen does have some attributes of a Russian kitchen, though it's not really grungy enough to be typically Russian, and a microwave would also not typically be found in most Russian kitchens. Only the wealthy would have satellite dishes. Almost everyone in Russia gets TV over cable. Also, they don't usually keep the TV and VCR tapes in the kitchen, either. ...though it's not really grungy enough to be typically Russian, and a microwave would also not typically be found in most Russian kitchens. ...Also, they don't usually keep the TV and VCR tapes in the kitchen, either. If it's really a kitchen. To me it looks more like a corner where the freezer and the microwave are just placed. It would be interesting to have closer look on the tapes. I can only spot a TDK tape and some movies, but nowhere in the picture any cyrillic characters. I'd also say Germany or Eastern Europe. The kitchen does have some attributes of a Russian kitchen, though it's not really grungy enough to be typically Russian, and a microwave would also not typically be found in most Russian kitchens. It's not a kitchen or a "corner". That's why I mentioned dorm, or maybe you guys call it a "residence", or whatever. It's a "home away from home" where youngish people stay while attending university, outside of their parent's house, but not yet in a real "house".In the lower right-hand corner of the pic, you can see what appears to be a small bed or futon. The tv/entertainment stuff/fridge/microwave/bed/chair, all in this little "corner"? It is her bedroom, lounge, kitchen all in one. Either an exceptionally small "studio" or other plan flat or apartment, or a university residence of some sort. I think WC hit the nail on the head. I didn't even notice that twin bed in the lower right. Funny, looks like the girl in the picture has an adam's apple! I showed the picture to my wife, who knows more about anatomy than me. She said "either she's got an enlarged thyroid or she used to be a bloke". Then, when I pointed out the feet to her, she said "that's a f*cking bloke"
^^^ SEE!! SEE!! I can tell if it's a man dressed as a woman from 100 yards.